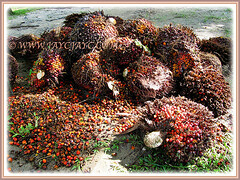 Palm Oil is an edible vegetable oil that can be used to manufacture numerous products. Unfortunately, the deforestation has destroyed large areas of verdant rainforest and exacerbated climate change and soil erosion. Resident species like elephants, orang-utans, rhinos and tigers have lost their homes and some indigenous peoples are being forced off their land and robbed of their livelihoods. Botanical Name: Elaeis guineensis (syn. : Elaeis macrophylla, Elaeis oleifera, Elaeis dybowskii, Palma oleosa). 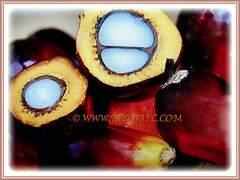 Common Names: Palm Oil, African Oil Palm, Kelapa Sawit in Malay. Etymology: The genus name Elaeis is from the Greek meaning oil. The specific epithet guineensis refers to the name for the area, Guinea and not the modern country which now bears that name. Origin: Native to west and southwest Africa between Angolia and the Gambia. 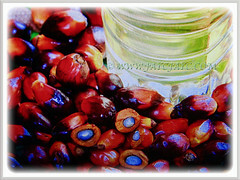 It is now cultivated throughout the tropics where it is the most important source of both palm oil and palm kernel oil. Plant type: A tropical perennial and ornamental palm. Features: Elaeis guineensis is from the genus Elaeis that consists of two species called oil palms. It is solitary tree with no branches. The oil palm tree comprises an extensive fibrous root system extending from the prominent trunk of the base, an erect stem of 0.3-0.6 m in diameter which can exceed 18 m in height if more than 30 years old.The leaves are pinnate and reach between up to 8 m long. 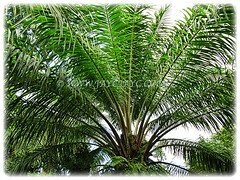 A young palm produces about 30 leaves a year while established palms over 20-40 leaves a year. 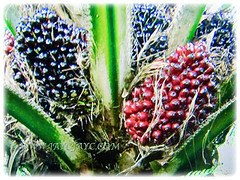 The palm fruit takes 5-6 months to mature from pollination to maturity. 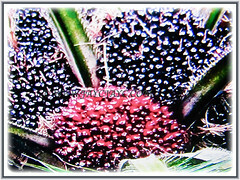 It ripens from green to yellow to red or black and is about the size of a large plum and grows in large bunches.Each fruit is made up of an oily, fleshy outer layer (the pericarp), with a single seed (the palm kernel), also rich in oil. When ripe, each bunch of fruit weighs between 5–30 kg depending on the age of the palm tree. The trunk, sometimes called a stipe, is the stem of the palm. At the tip of the stem there is what makes the oil palm live and grow. 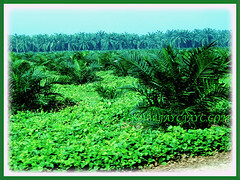 The growing point of the adult oil palm produces 20 to 25 leaves every year. It is most important that the growing point should produce many leaves since there will be a flower at the base of each leaf. If there are many leaves, there will be many flowers. And if there are many flowers, there will be many clusters of fruit. The clusters consist of spikelets. The spikelets contain the fruit. Before getting the oil out of the fruit, the fruit must be separated from the spikelets. 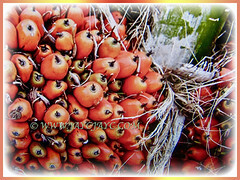 The fruits of the oil palm consist of the pulp which yields the palm oil and seed which yields the palm kernel oil. 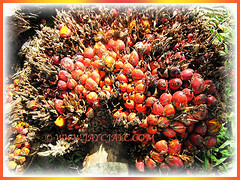 Palm oil is an edible vegetable oil derived from the reddish pulp of the fruit of the oil palms. 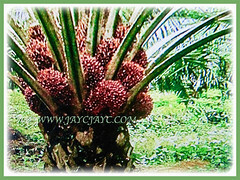 Palm oil is naturally reddish in color because of a high beta-carotene content. The oil palm is said to be monoecious with the male and female flowers occur separately on the same plant. An inflorescence emerges at the axil of every leaf and is a compound spike or spadix carried on a stout peduncle enclosed in a woody spathe. The clusters consist of spikelets that contain the fruit. The spikelets are spirally arranged from a central rachis. About a month after the inflorescence emerges above the base of the petiole, the outer spathe splits open. A further 2-3 weeks later, the inner spathe splits and the flowers more or less embedded in the spikes are exposed. There may be 100-300 spikelets and over 2000 individual flowers. The fruit is a sessile drupe varying in shape from nearly spherical to ovoid or elongated. In length it varies from about 2-5 cm. Culture (Care): Elaeis guineensis or African Oil Palm grows well and produces a lot in regions where it is very hot, where the sun is very strong and where it rains a great deal. Moisture: Moderate to high water needs. Water regularly to maintain a moist soil but not in a saturated condition. Soil: Grows on a wide range of soils ranging from loamy sand to heavy clays and deep peats. It has to be well-draining too. As the oil palm is thought to have a swamp origin, a well drained alluvial soil is probably best. Others: To encourage healthy growth, plants are watered weekly with a week solution of ammonium sulphate, urea of comp0und fertiliser with a formula of 15:15:6:4 from the one leaf stage of transplanting time. However, more frequent application may be made if seedlings appear yellowish green. Oil palm, like any other agricultural crop is beset by problems of diseases and pests which if uncontrolled can lead to its death. Diseases such as vascular wilt, bacterial bud rot, dry basal rot and Ganoderma trunk rot have been devastating in Africa while in the Far East, basal stem rot is equally destructive. Nursery palms are attacked by a fairly wide range of pests from mites, insects to rats. Most are leaf eating insects but rats are the most damaging as whole plants are destroyed. Elaeis guineensis or African Oil Palm can withstand frost with little damage. It may be defoliated but always comes back. For high production, mean maximum temperature should be 29-30°C and mean minimum about 22-24°C. These conditions are found in most parts of the tropics. However, in high altitudes, temperatures can fall below 21°C and in the inland areas of Congo, night temperature is also below 21°C. Such low temperatures are said to reduce crop considerably by affecting bunch development. With young seedlings, there is evidence that below 15°C, cessation of growth occurs. Flowering begins from spring and through summer. Propagation: Easily propagated by sowing the seeds. Usage: Elaeis guineensis or Palm Oil is an edible vegetable oil. It can be used to manufacture numerous products, including baked goods, confectionery, shampoo, cosmetics, cleaning agents, soap products and toothpaste. Its products, palm oil, palm kernel and palm kernel oil are important sources of foreign exchange earnings of many developing countries, chiefly Malaysia and Indonesia in Southeast Asia and Nigeria and Congo in Africa. Palm oil is an important source of calories and a food staple in poor communities. In traditional African medicine, different parts of the plant are used as a laxative and diuretic, as a poison antidote, as a cure for gonorrhea, menorrhagia and bronchitis, to treat headaches and rheumatism, to promote healing of fresh wounds and treat skin infections.